Pigeon Point Light Station State Historic Park preserves the history of the lighthouse located here and documenting its importance to ship-based commerce in the development of the United States. It continues to function as a U.S. Coast Guard Aid Station, but the navigation light that had first been lit in 1872 now lies dormant. The buildings in front of the lighthouse can actually be rented for overnight stays. 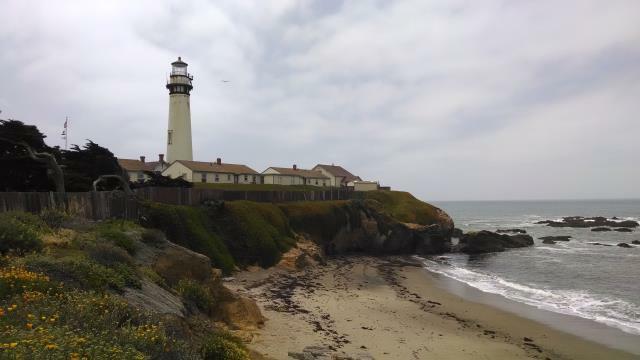 At 115 feet, the lighthouse is one of the tallest in the U.S. The view from the top must be fairly impressive but it's not possible to determine this first hand since the tower itself is closed to the public. In 2001, a section of the cornice at the top of the edifice broke away, raising fears about the structural integrity of the structure. Repairs are underway and the plan is to reopen at some point in the future. For now, the other support buildings, including the one that displays the intricate Fresnel lens that used to be atop the tower, highlight the history of the location. No beautiful spot along the California Pacific coast should be without a trail. Pigeon Point cooperates with a short trail that starts off at the lighthouse and follows the bluff looking over the beaches below. This path along the bluff is labeled "Mel's Lane" on the park brochure. At one point the trail descends a set of stairs into a small semi-private cove with a sandy beach that can be seen from the lighthouse buildings. The trail along the bluffs provide nice views of the ocean including the towering Prisoner Island, named for the fact that many fishermen had become stranded upon it over the years. At the park property line northeast of the lighthouse, the trail loops around into a small balloon and doubles back. At the southernmost tip of the park, not far from the lighthouse, there's a viewing platform that sits on a ricky perch overlooking the ocean and few of the small islets that dot the shore. Here one can occasionally spot migrating whales. More common are numerous shore birds that nest or rest on the globs of rock isolated from the mainland and its predators. The pull here is the lighthouse, which unfortunately is closed for repairs. There's a short trail heading south of the lighthouse that follows along the bluff overlooking the shoreline below. There's even a set of stairs that goes down to a small beach that the lighthouse overlooks.